A few weeks ago I was driving along minding my own business (well, as much as you can mind your own business when you’re a nosy snot like me) and I happened across some truly terrifying graffiti. Unless you count the large criminal enterprise that I run inside my head, I’m not in a gang. Or into graffiti. Here’s a fun fact, I flunked out of art college. So my opinion on things like gang tags, intimidation tactics and what constitutes art has absolutely no basis in reality, so when I say that this particular piece of graffiti terrified me, you probably aren’t going to believe me. Because it did. It terrified me so much that I made a special trip back around the roundabout to take a photo of it. Yes, driving one handed holding a phone, around a roundabout on a wet afternoon, with my kid in the car (mother of the year!). It has got to be seen to be believed! Are you ready? Here it is, as large as I can make it! If you’re confused, don’t worry. So was I. 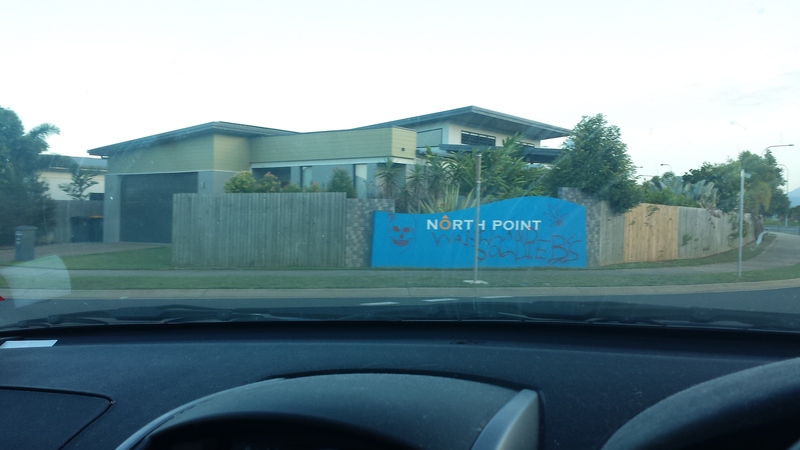 Sadly this masterful work of art was swiftly painted over, no doubt by an overzealous developer afraid that property prices would suddenly slip through the floorboards. It does indeed say, “WAISTLAND SOLDIEB’S”, although I think that it might even be “WAISILAND”. The skull is pretty skull-like though, so I imagine it was the work of someone who probably spent more time stealing lunch money and looking tough than paying attention in school. I *think* that is supposed to be a cannabis leaf on the top right, although in the minimised version I’m looking at currently it kind of looks like a butterfly. Truly heinous. If this was my gang, I would be totally kicking out the dude who tagged this place. Or chop off his hands, I’m not sure which is more appropriate. I think they are a gang, because if they were waging a war (soldiers) against obesity (waistland), then the skull is totes relevant but the last time I checked pot wasn’t exactly conducive to healthy eating. Being blitzed would explain the apalling spelling… but I really don’t think there is any excuse in the world for confusing the letters R and B. I’m not even going to touch the presumed apostrophe in there. If the purpose of this art was to intimidate then they failed miserably. I just laugh when I see this because it’s just so, so… amateur (laugh, and then get terrified for the future of the English language). C’mon gang dudes, lift your game! You’ll never get a job in my criminal organisation if you can’t spell. I Want To Read Your Books!